I live with cystinosis. Cystinosis is a very rare genetic disease that causes cells to crystallize causing early cell death. It slowly destroys the organs in my body including the kidneys, liver, eyes, muscles, and brain. As I age, the disease affects my body further, inflicting damage to multiple organ systems. I take many medications to slow the progression of the disease but there is no cure. I am working to change this! This August I am doing a grassroots fundraiser at the Urban Abbey for cystinosis research to fund a cure. The money raised will go directly to the Cystinosis Research Foundation (CRF) the largest non-profit 501(c)3 fund provider of cystinosis research in the world. To date, the CRF has funded and committed more than $18 million to cystinosis research and has awarded 114 research studies and fellowships in 11 countries. The CRF research funded at the University of California, San Diego (UCSD) has resulted in the development of a slow-release form of cysteamine the medication used to slow the progression of cystinosis. On April 30, 2013, the FDA approved the new drug Procysbi. Let me tell you a little about my story of living with cystinosis. I am 23 years old. 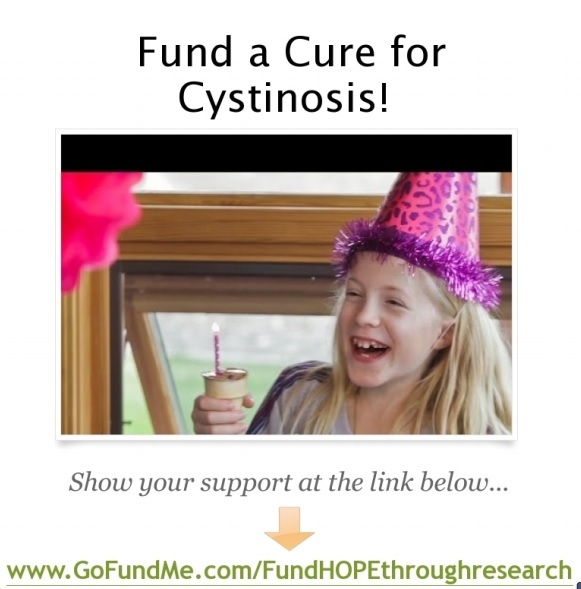 I was born with cystinosis and diagnosed around age 10 months. I have already had kidney failure and this disease has been a struggle for me and my friends and family. It has caused a lot of trauma. I cannot even comprehend how difficult it was for my family to get the news of my diagnosis and how it will eventually take my life if we do not find a cure. I began dialysis in May of 2011, when my kidney failure reached a point that I could not live without it and I was a patient at the University of Nebraska Medical Center (UNMC). When I first started dialysis, I was on hemodialysis. Fortunately, I was only on this form of dialysis for about 9 months when I learned about peritoneal dialysis and switched to it. Today, I am living with a new kidney and doing wonderfully in aspects of my renal (kidney) health. I received a living donor kidney transplant and had the transplant surgery done at the University of Iowa Hospitals and Clinics (UIHC). The transplant team at UIHC have been impressed with how well I am doing and how my body accepted the kidney and recovered from surgery. Even my blood levels are great! My creatinine level, which determines how well the kidney is doing, is 0.8.! This number is awesome! I am now down to only having blood draws to check my levels once every other month and I don’t need to see the transplant team until June of 2015. As the years go by and I celebrate my birthday, it is becoming a bit difficult because living with cystinosis I need to have more honest and open discussions about what adult life with cystinosis entails. Yes, I got the kidney that is sustaining my life; it is giving me more years. Nevertheless, my health is slowly deteriorating, I have pain in my eyes, my muscles are weakening and I do have a lot of fatigue, it is my companion and I must recognize and work with it. As I age, I take on more responsibility with my health and advocating for myself. It is a lot. 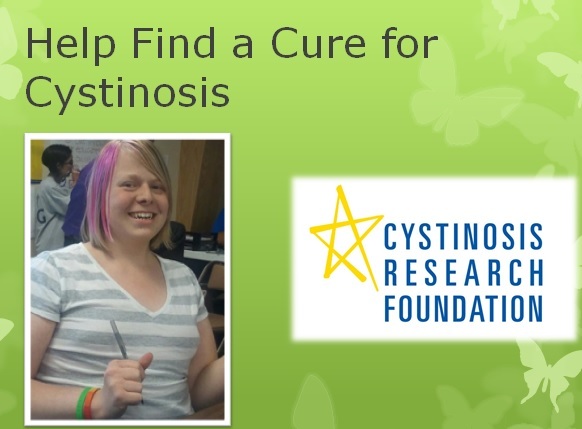 “What sustains the cystinosis community from the harsh realities and daily life with cystinosis is the hope and promise of better treatments and a cure for cystinosis. It is all about research.” – Nancy Stack Chair and Founder of the Cystinosis Research Network and Parent of a cystinosis patient. Next Thank you! Still time to Give HOPE through Research!